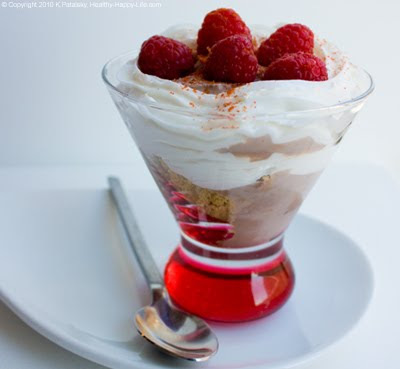 Chocolate Pom-Rasp Pudding Parfait or Pie. Heart. 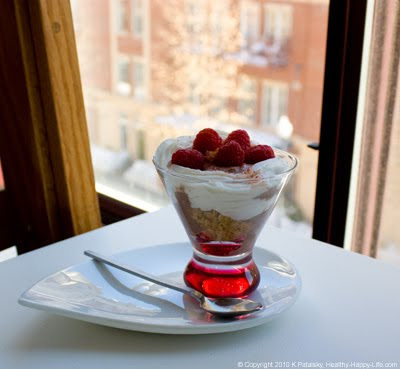 There's one day of the year when the romantic combination of chocolate and red fruit tastes best: Valentine's Day. 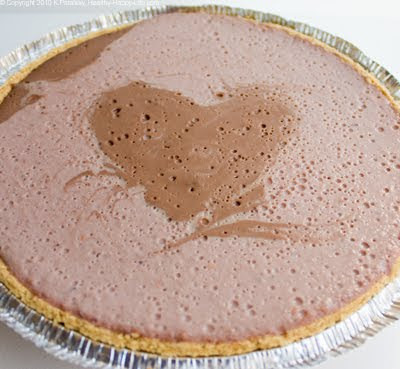 We Heart Desserts. Chocolate covered strawberries, a choco-berry shake or even a chocolate-covered strawberry cake. 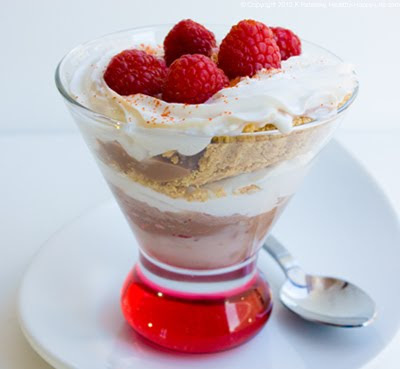 Well now you have one more sweet silky dish to add to your chocolate meets red fruit repertoire: my Chocolate Pom-Rasp Pudding Parfait or Pie. 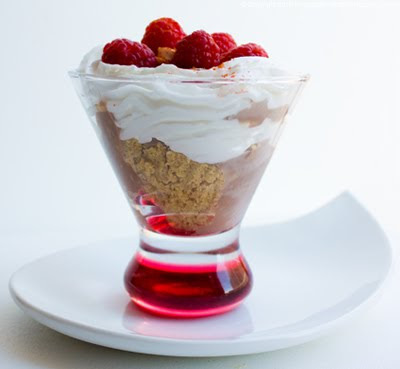 Get creative: make a creamy no-bake pie, fill up parfait glasses complete with fluffy rice whip, or simply eat it by the spoonful with an avalanche of fresh raspberries on top. 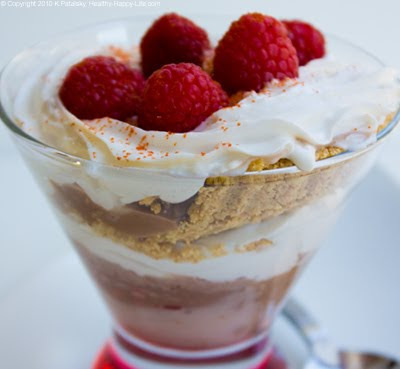 Pudding Pie or Parfait? When making this dish you have a few options in the outcome. 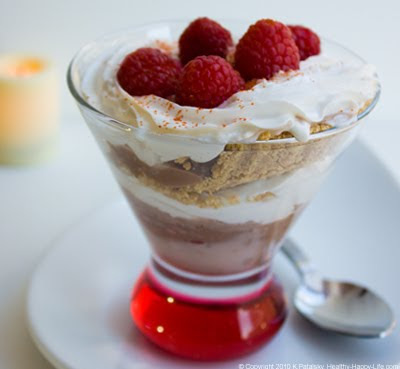 You can pour the pudding into a graham cracker crust pie shell or you can scoop it layer by layer and build a parfait. 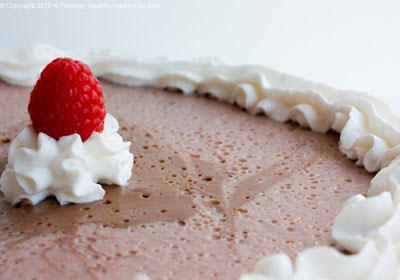 You also have the option to adjust the thickness of your pudding. 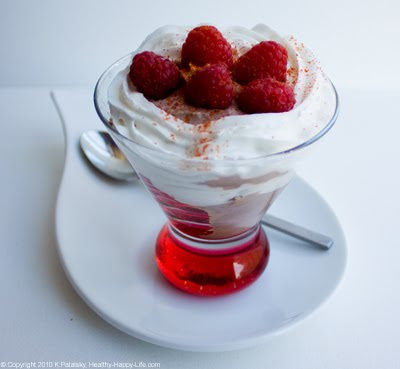 If you want a firmer pudding - keep the recipe as is. If you want a silkier yogurt-consistency pudding, add 1/4-1/2 cup more soy milk to each recipe during the boiling stage of the directions. Pomegranate Juice. 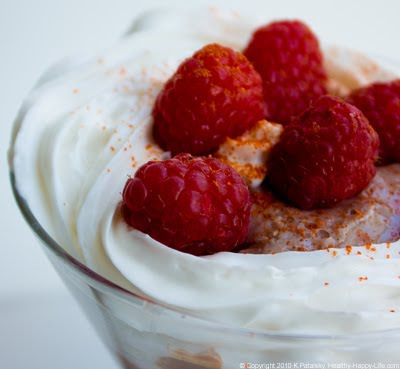 The recipe is heart-healthy due to the pomegranate juice, soy tofu, antioxidant-rich dark chocolate and even the fresh raspberries. Read all about pomegranate juice's superfruit and heart-health facts here. 1. 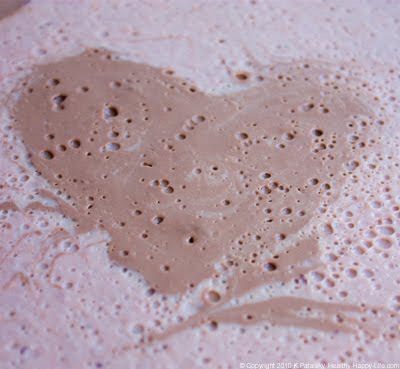 Pour cold soy milk, opt'l arrowroot powder and pudding mix into a soup pot. Whisk to blend. 2. Turn on stove to high. Place pot over stove. Stir continuously, while liquid begins to boil and thicken. 3. Add in pomegranate juice, salt, tofu and sugar. Reduce heat a bit and continue gently stirring so sides do not burn. 4. Mash the tofu a good bit and when pudding mix has thickened, (this should take about 2-4 minutes) remove from heat and set aside for a few minutes to cool before blending. 5. Transfer vanilla pudding to blender (note: it will be considerably chunky before blending). 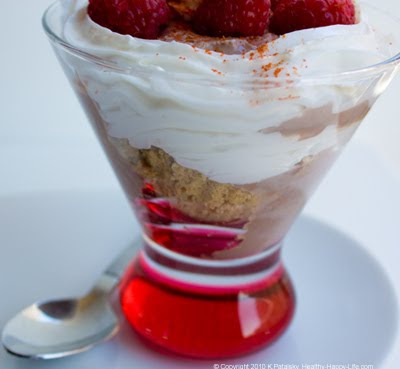 Also add in the brazil nuts and raspberries. 6. Gently blend on low until all the ingredients have smoothed out. Always use extreme caution when blending heated ingredients. 7. Transfer to container to set aside - and continue onto the chocolate pudding. 3. Add in salt, tofu, spices and chocolate. Reduce heat a bit and continue gently stirring so sides do not burn. 5. Transfer chocolate pudding to blender (note: it will be considerably chunky before blending). 6. Gently blend on low until all the ingredients have smoothed out. Scrape sides well. Always use extreme caution when blending heated ingredients. 8. Allow to chill for at least 30 minute before serving. Overnight is best. Amount Note: This recipe contains two pudding recipes. One for the Pom-Rasp Pudding and one for the dark chocolate spice pudding. Each recipe makes about 4 cups of pudding - so you will have leftovers I'm sure. But that's OK! Just store in fridge and eat within a few days. You can also halve the recipes if you want a smaller portion prepared. Ingredients Note: You will need, in addition to the recipe ingredients below, a graham cracker pie shell (if doing a pie), some fresh berries for garnishing, and also some optional rice whip.